What Is Concrete Pumping in Denton? Concrete pumping is a more efficient way of pouring concrete, using a machine to transfer liquid concrete. There are two basic types of pumps that are used, concrete ‘boom pump’ and the other is commonly called a concrete ‘line pump’ or concrete trailer pump. The boom pump uses a remote controlled robotic arm to place concrete where it needs to go, and they’re often used in large construction projects. Concrete boom pumps are able to pump concrete at high volumes and are extremely accurate, which is why they are used for larger projects. The line pump uses flexible or steel hoses attached to the outlet of the concrete pump and linked together to wherever the concrete needs to go. This type of pump is usually used for interiors where concrete boom trucks can't get to. Concrete line pumps are also better suited for smaller jobs like swimming pools, ground slabs and sidewalks. Speed of the pour is always an important factor when it comes to any-sized construction project. One of the many benefits of concrete pumping is that it is a faster way to place concrete over more traditional methods. Faster placement means you’re able to stay within any deadlines and you can use just the one piece of equipment to complete one concrete pour. When concrete pumping isn’t used, smaller equipment may have to be moved around to different spots to finish off one pour. Anyone who has been involved in any sort of construction job knows that labor is a big part of the total expense of the project. Obviously, the labor force is integral, but if it can be reduced without affecting quality and safety, it will help boost the bottom line. Concrete pumping generally requires less in the way of labor than other methods of concrete pouring. The site will seem less congested, and you can also use key personnel for other important tasks when the concrete is placed directly. With concrete pumping, less water is needed than with other methods. This means that when the concrete is placed it won’t shrink and crack at all and it will maintain its strength. It kind of goes without saying how important it is for concrete to be strong and secure over time. Concrete pumping results in a more stable end product, which means the safety level of your project is higher and the durability is also higher. For the customer, a more durable concrete product means you won’t have to pay for maintenance or a brand new pour for a longer period of time, which is going to save money. Using a boom or a line pump for pumping concrete is going to improve your pouring accuracy. For complex locations, high-rise buildings or insulated concrete form walls, accuracy is of the utmost importance. Accurate pumping means fewer stoppages, fewer delays and a more professional-looking end result. Any company that pours concrete as its main business knows how important it is to present a professional result to the clients and to the public. Many people won’t really notice when a job is done well, but they will certainly notice when there are drips and spills and messy pours. Overall, using either type of concrete pumping system is just more convenient than the old mix and pour methods. Boom arms can actually reach over top of house or other structures to place the concrete in locations where other types of machinery can’t reach. The convenience factor means that jobs that were previously ‘undoable’ can now be completed, and with a high degree of accuracy and precision. The concrete pumping convenience factor makes it easier on workers, enables a company to take on new projects and can ultimately increase sales. Then at the end of the day, increasing sales is really what every business is all about. 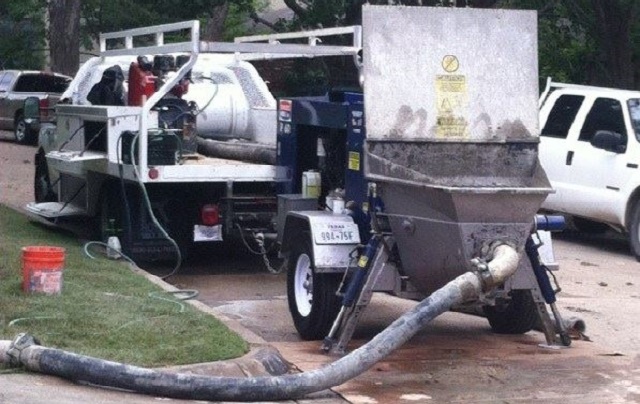 Our Concrete Pumps can Typically Empty a Truck in Approximately 20 Minutes.